Kathryn R. Fingar, Ph.D., M.P.H., Halcyon Skinner, Ph.D., M.P.H., Jayne Johann, M.B.A., Natalia Coenen, M.P.H., William J. Freeman, Dr.P.H., M.P.H., and Kevin C. Heslin, Ph.D.
An estimated 22.7 million Americans need treatment for a problem related to alcohol or drugs, but only a small fraction (<1 percent) receive it.16 Furthermore, access to treatment varies widely across the United States.17,18 Although substance use can be addressed effectively in ambulatory care and other community settings, hospitalization remains a key component of the continuum of care for individuals with a substance use disorder. A better understanding of geographic variation in types of substance-related hospitalizations across the country may inform State and local efforts to increase access to substance use disorder treatment. First, State-level rates of inpatient stays involving common types of substances are shown. Second, county-level rates of stays involving the four most common types of substances (alcohol, opioids, cannabis, and stimulants) are examined. Finally, the cost of substance-related stays overall and for these four substances is presented for each State. If an inpatient stay involved multiple substances, the stay was counted in each substance type. Data are suppressed for counties if they are based on a small number of inpatient stays or hospitals, if they are statistically unstable, or if there was incomplete reporting. Thus, in this Statistical Brief, the highest and lowest rates of substance-related stays are described only among counties with unsuppressed data. All differences noted in the text are 10 percent or greater. Readers should note that the substance definitions used in this Statistical Brief were developed for the Community-Level Statistics path of HCUPnet.21 The definitions may differ from those in other Statistical Briefs. In particular, the opioid definition used here includes opioid dependence/abuse in remission and neonatal abstinence syndrome and does not include opioid substances causing adverse effects in therapeutic use. As a result, rates of substance-related inpatient stays may differ somewhat from similar rates reported elsewhere (e.g., opioid statistics available in HCUP Fast Stats, statistics based on the Clinical Classification Software category for substance-related disorders). Table 1 presents the leading types of substances involved in inpatient stays within 31 States and the nation overall. The State-level rate of stays per 100,000 population is presented for all substances combined, including the most common types of substances shown, as well as other types of substances that are not shown, such as sedatives. For each of the three most common types of substances, the State-level rate and share of stays, as a percentage of total stays for all substance types, are shown. Data are sorted in descending order by the rate of total stays for all types of substances combined. An inpatient stay may be counted under multiple categories if it involved more than one type of substance. From 2013 to 2015, there was an average of 1 substance-related inpatient stay annually for every 100 people in the United States. Alcohol, opioids, cannabis, and stimulants were the most common substances. Of counties in the 31 States in this Statistical Brief, Baltimore City, Maryland had the highest rates of opioid (1,592 per 100,000 population), cannabis (843), and stimulant (931) stays and the third highest rate of alcohol-related stays (1,955). Counties in Texas had the lowest rates of opioid (Starr, 15 per 100,000) and cannabis (Val Verde, 19) stays, and the second lowest rate of alcohol-related stays (Kendall, 139). a The rate of inpatient stays per 100,000 population was calculated annually and then averaged across the 3 years (2013-2015), weighted by the population total in each year. State-level rates are based on data from all counties, including those with suppressed county-level data in subsequent figures. b Other drug abuse includes such things as combinations of or unspecified drug dependence, drug dependence complicating pregnancy, antidepressant abuse, and poisoning by common cold medicines. A full definition is provided in Table 3 starting on page 23. Note: Inpatient stays may involve more than one type of substance. Thus, substance-specific rates may sum to more than the rate for all substances combined. Source: Agency for Healthcare Research and Quality (AHRQ), Center for Delivery, Organization, and Markets, Healthcare Cost and Utilization Project (HCUP), 2013-2015 National Inpatient Sample (NIS) and 2013-2015 State Inpatient Databases (SID) for 31 States, which, at the time this Statistical Brief was written, released data through the Community-Level Statistics path on HCUPnet, an online query tool. For every 100 people in the U.S. population, there was 1 substance-related inpatient stay per year. Rates of substance-related inpatient stays varied over two-fold across States. 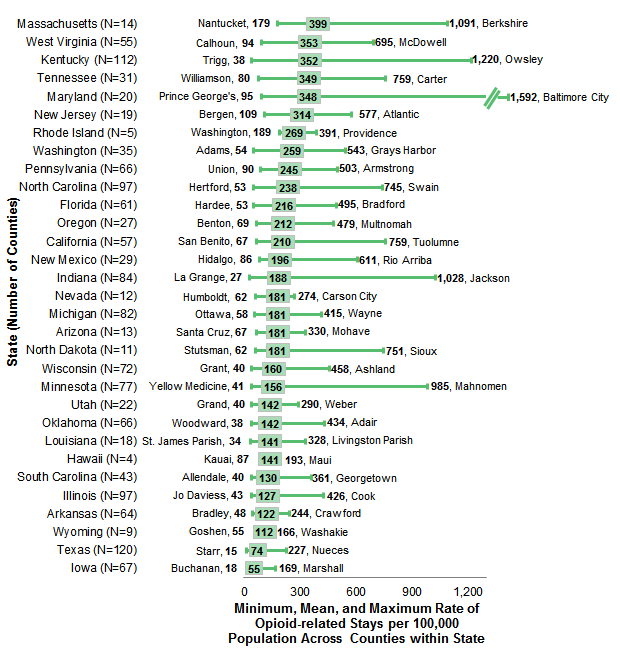 After Utah and Iowa (624 per 100,000 population), Texas and Hawaii had the next lowest State-level rates of substance-related stays (690 and 863 per 100,000 population, respectively). Alcohol was the most common type of substance among inpatient stays overall and in each of the 31 States. At the national level, there were 588 alcohol-related stays per 100,000 population and alcohol was involved in 55.3 percent of all substance-related stays. At the State level, the rate of alcohol-related stays ranged from 282 per 100,000 population in Utah to 894 per 100,000 population in Rhode Island. Nationally and in most States, opioids were the second most common type of substance among inpatient stays. Opioids did not rank among the three most common types of substances in Oklahoma, California, South Carolina, Arkansas, Hawaii, Texas, and Iowa. Notably, these States also had some of the lowest overall rates of stays for all substances combined (ranging from 624 per 100,000 population in Iowa to 970 per 100,000 population in Oklahoma). Nationally, cannabis was the third most common type of substance among inpatient stays. Stimulants ranked as the second most common type of substance among inpatient stays in California, Hawaii, and Texas. Stimulants were involved in 32.5 percent of substance related stays in Hawaii, 23.4 percent of substance-related stays in California, and 18.1 percent of substance-related stays in Oregon. Figures 1 through 4 present characteristics of the distributions of county-level rates of inpatient stays involving the four most common types of substances: alcohol, opioids, cannabis, and stimulants. The figures display the minimum, mean, and maximum rate (per 100,000 population) across counties within the 31 States included in this Brief. The county name is listed alongside the minimum and maximum values. The States are ordered according to the mean county-level rate. Note that the means of county-level rates in Figures 1-4 (averaged across all counties in each State)22 may differ from the State-level rates presented in Table 1. Notes: The middle box represents the mean rate across all counties in the State. The lower and upper ends of the lines indicate the minimum and maximum values, respectively. Statistics are suppressed for counties if the reporting cell draws from fewer than two hospitals, contains fewer than 11 discharges, or has a relative standard error (standard error / weighted estimate) greater than 0.30 or equal to 0, or because the county is missing 2 percent or more of total discharges in the HCUP State Inpatient Database (SID) when compared with the Medicare Hospital Service Area File. Source: Agency for Healthcare Research and Quality (AHRQ), Center for Delivery, Organization, and Markets, Healthcare Cost and Utilization Project (HCUP), 2013-2015 State Inpatient Databases (SID) for 31 States, which, at the time this Statistical Brief was written, released data through the Community-Level Statistics path on HCUPnet, an online query tool. Cluster bar chart that shows rate of alcohol-related inpatient stays per 100,000 population in the county with the highest and lowest rate and the mean rate by State from 2013 to 2015. The counties with the three highest rates of alcohol-related stays were in North Dakota, Wisconsin, and Maryland; whereas the three lowest county rates were in Utah, Texas, and Iowa. County-level rates of alcohol-related stays varied widely in North Dakota, Wisconsin, and Texas, where the highest county rate was 8-9 times greater than the lowest county rate within each of the three States. In North Dakota, the rate of alcohol-related stays was 9 times higher in Sioux County (2,725 per 100,000 population) than in Oliver County (310 per 100,000 population). In Wisconsin, the rate of alcohol-related stays was 8 times higher in Menominee County (1,987 per 100,000 population) than in Grant County (247 per 100,000 population). In Texas, the rate of alcohol-related stays was 8 times higher in Potter County (1,104 per 100,000 population) than in Kendall County (139 per 100,000 population). Cluster bar chart that shows rate of opioid-related inpatient stays per 100,000 population in the county with the highest and lowest rate and the mean rate by State from 2013 to 2015. Two of the three counties with the highest rates of opioid-related stays were in Kentucky. The counties with the three lowest rates of opioid-related stays were all in Texas. County-level rates of opioid-related stays varied widely in Indiana, Kentucky, and Minnesota, where the highest county rate was over 24 times greater than the lowest county rate in each State. In Indiana, the rate of opioid-related stays was 38 times higher in Jackson County (1,028 per 100,000 population) than in La Grange County (27 per 100,000 population). In Kentucky, the rate of opioid-related stays was 32 times higher in Owsley County (1,220 per 100,000 population) than in Trigg County (38 per 100,000 population). In Minnesota, the rate of opioid-related stays was 24 times higher in Mahnomen County (985 per 100,000 population) than in Yellow Medicine County (41 per 100,000 population). Cluster bar chart that shows rate of cannabis-related inpatient stays per 100,000 population in the county with the highest and lowest rate and the mean rate by State from 2013 to 2015. Counties with the three highest rates of cannabis-related stays were in Maryland, Massachusetts, and North Dakota. The three counties with the lowest rates of cannabis-related stays were in Texas and Iowa. County-level rates of cannabis-related stays varied widely in Texas, Illinois, and Wisconsin, where the highest county rate was over 13 times greater than the lowest county rate in each State. In Texas, the rate of cannabis-related stays was 20 times higher in Potter County (376 per 100,000 population) than in Val Verde County (19 per 100,000 population). In Illinois, the rate of cannabis-related stays was 16 times higher in Marion County (498 per 100,000 population) than in Jo Daviess County (31 per 100,000 population). In Wisconsin, the rate was 13 times higher in Menominee County (403 per 100,000 population) than in Grant County (30 per 100,000 population). 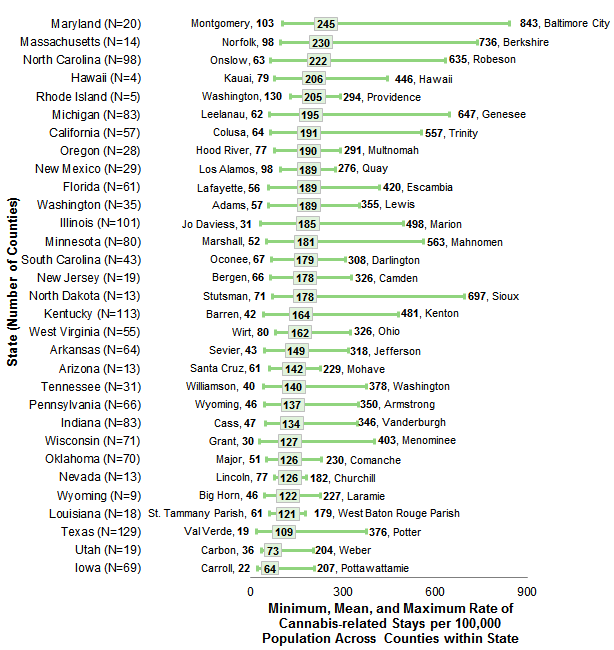 Cluster bar chart that shows rate of stimulant-related inpatient stays per 100,000 population in the county with the highest and lowest rate and the mean rate by State from 2013 to 2015. Counties with the three highest rates of stimulant-related stays were in Maryland, California, and Massachusetts. The three counties with the lowest rates of stimulant-related stays were in Wisconsin and Michigan. County-level rates of stimulant-related stays varied widely in Pennsylvania, Wisconsin, and Maryland, where the highest county rate was 23-26 times greater than the lowest county rate in each State. In Pennsylvania, the rate of stimulant-related stays was 26 times higher in Philadelphia County (469 per 100,000 population) than in Wayne County (18 per 100,000 population). In Wisconsin, the rate of stimulant-related stays was 25 times higher in Milwaukee County (294 per 100,000 population) than in Oconto County (12 per 100,000 population). In Maryland, the rate was 23 times higher in the county of Baltimore City (931 per 100,000 population) than in Garrett County (41 per 100,000 population). Figures 5 and 6 display maps of county-level rates of alcohol-, opioid-, cannabis-, and stimulant-related inpatient stays in 2013-2015 for the 31 States included in this Brief. Rates were categorized into quintiles after ranking all counties in the 31 States with data that were not suppressed. Counties with rates in the highest quintile (top 20 percent) were considered hot spots. Hot spots of alcohol-related stays (i.e., counties with rates in the highest quintile) were particularly concentrated in Rhode Island and Massachusetts, where 80 and 71 percent of counties in the State, respectively, had a rate in the highest quintile. Hot spots of opioid-related stays were particularly concentrated in West Virginia, as well as in Massachusetts. In these States, 66 and 64 percent of counties, respectively, had a rate in the highest quintile. In Oklahoma, most counties (81 percent) had an alcohol-related stay rate in the three lowest quintiles, yet two counties (Kiowa and Roger Mills) had an alcohol-related stay rate in the highest quintile. In Utah, 82 percent of counties had an opioid-related stay rate in the three lowest quintiles, yet one county (Weber) had a rate in the highest quintile. In South Carolina, 84 percent of counties had an opioid-related stay rate in the three lowest quintiles, yet two counties (Darlington and Georgetown) had a rate in the highest quintile. Notes: County-level data are unavailable for States in grey. Data are suppressed if the reporting cell draws from fewer than two hospitals, contains fewer than 11 discharges, or has a relative standard error (standard error/weighted estimate) greater than 0.30 or equal to 0, or because the county is missing 2 percent or more of total discharges in the HCUP State Inpatient Database (SID) when compared with the Medicare Hospital Service Area File. Two color-coded maps that show the county-level rates per 100,000 population for alcohol- and opioid-related inpatient stays from 2013 to 2015 for 31 States. For alcohol, high concentrations of counties with the highest rates are seen in Massachusetts, Rhode Island, Maryland, Florida, Wisconsin, Minnesota, and New Mexico. High concentrations of counties with the lowest rates are seen in Louisiana, Texas, Iowa, Arkansas, and Utah. For opioids, high concentrations of counties with the highest rates are seen in Massachusetts, Rhode Island, West Virginia, and Kentucky. High concentrations of counties with the lowest rates are seen in Texas and Iowa. The percentage of counties with a cannabis-related stay rate in the highest quintile reached 45 percent in North Carolina and 40 percent in Maryland and Rhode Island. Hot spots of stimulant-related stays tended to be most concentrated in California and North Carolina. In these States, the percentage of hot-spot counties was 63 and 56 percent, respectively. In Oklahoma, most counties (73 percent) had a cannabis-related stay rate in the three lowest quintiles, yet two counties (Comanche and Greer) had a rate in the highest quintile. 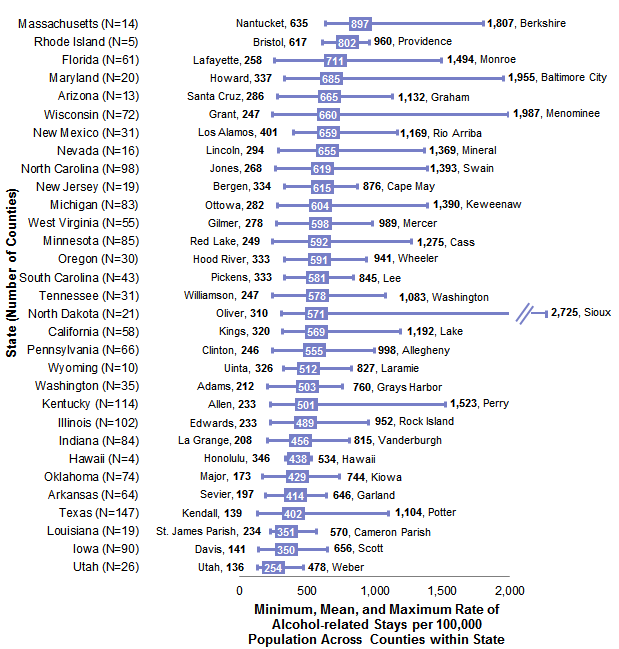 Similarly, in Iowa (94 percent), Wisconsin (85 percent), and Pennsylvania (82 percent) the vast majority of counties had rates of stimulant-related stays in the three lowest quintiles, yet a small number of counties in these States had a rate in the highest quintile: Pottawattamie (Iowa); Burnett, Menominee, Douglas, and Milwaukee (Wisconsin); and Allegheny and Philadelphia (Pennsylvania). Two color-coded maps that show the county-level rates per 100,000 population for cannabis- and stimulant-related inpatient stays from 2013 to 2015 for 31 States. For cannabis, high concentrations of counties with the highest rates are seen in Massachusetts, Rhode Island, Maryland, Hawaii, and North Carolina. High concentrations of counties with the lowest rates are seen in Iowa, Wisconsin, Texas, and Utah. For stimulants, high concentrations of counties with the highest rates are seen in Hawaii, California, Oregon, Washington, New Mexico, and North Carolina. High concentrations of counties with the lowest rates are seen in Wisconsin, Michigan, Iowa, Indiana, and Pennsylvania. Figure 7 displays the average cost per type of substance-related inpatient stay by State in 2013-2015. States are ordered by the average cost per alcohol-related stay. The average cost of all inpatient stays (substance and nonsubstance-related) within each State is listed on the y-axis next to the State names. Note: Average cost per stay was calculated annually and then averaged across the 3 years (2013-2015), weighted by the population total. Source: Agency for Healthcare Research and Quality (AHRQ), Center for Delivery, Organization, and Markets, Healthcare Cost and Utilization Project (HCUP), 2013-2015 National Inpatient Sample (NIS) and 2013-2015 State Inpatient Databases (SID) for 31 States, which, at the time this Statistical Brief was written, released data through the Community-Level Statistics pathway on HCUPnet, an online query tool. Clustered bar chart that shows average cost in thousands of dollars of substance-related inpatient stays for all stays and for alcohol, opioids, cannabis, and stimulants for 2013 to 2015. Nationally, of the four most common types of substance-related stays, those involving alcohol cost the most on average, followed by opioid-, stimulant-, and cannabis-related stays. Of the four most common types of substances involved in inpatient stays, alcohol-related stays had the highest average cost, followed by opioid-, stimulant, and cannabis-related stays. The average cost per stay for some types of substances was higher than that of inpatient care in general. For instance, in California both alcohol- and opioid-related stays ($17,200 per stay) were on average costlier than all inpatient stays ($14,900 per stay). Among the 31 States, the average cost per alcohol-, opioid-, cannabis-, and stimulant-related stay was highest in California, Hawaii, and Washington, where the average cost of inpatient stays overall also was highest. Alcohol: The highest average cost per alcohol-related stay was $17,200 in California, followed by $16,500 in Hawaii, and $14,800 in Washington. Opioids and cannabis: Hawaii had the highest average cost of opioid- and cannabis-related stays ($17,500 and $13,000, respectively), followed by California ($17,200 and $12,400) and Washington ($14,700 and $12,000). Stimulants: The highest average cost per stimulant-related stay was $14,300 in California, followed by $13,400 in Washington and $12,900 in Hawaii. Inpatient stays overall: California, Hawaii, and Washington also had a higher average cost of all inpatient stays (including substance-related and non-substance-related stays) compared with other states ($14,900, $13,900, and $13,400, respectively). Average costs of the four most common substance-related stays were lowest in Louisiana ($8,100 per alcohol-related stay, $6,600 per opioid-related stay, $6,000 per stimulant-related stay, and $5,900 per cannabis-related stay). Table 2 presents the per capita cost of inpatient stays involving any substance type and of stays involving the four most common types of substances. The State-level statistics are sorted by the per capita cost of inpatient stays involving all types of substances combined. Per capita costs are presented alongside the percentage of counties in each State with a substance-related stay rate in the highest quintile (quintile 5), which were considered hot spots. a The cost per capita (cost per 1 individual in the population) was calculated annually for each State and then averaged across the 3 years, weighted by the population total. b Hot spots were defined as counties with a substance-related inpatient stay rate in the highest quintile (top 20 percent). Note: Inpatient stays may involve more than one type of substance. Thus, substance-specific costs may sum to more than the cost for all substances combined. Source: Agency for Healthcare Research and Quality (AHRQ), Center for Delivery, Organization, and Markets, Healthcare Cost and Utilization Project (HCUP), 2013--2015 National Inpatient Sample (NIS) and 2013-2015 State Inpatient Databases (SID) for 31 States, which, at the time this Statistical Brief was written, released data through the Community-Level Statistics pathway on HCUPnet, an online query tool. On average, $119 was spent annually per U.S. resident on substance-related inpatient stays from 2013 through 2015. Nationally, the average annual per capita cost of inpatient stays involving all substances combined was $119 from January 2013 through September 2015. Alcohol-related stays constituted the greatest percentage of per capita costs, followed by opioids, cannabis, and stimulants. Rhode Island, Massachusetts, and California had the highest per capita costs of substance-related stays. Rhode Island and Massachusetts had the highest per capita costs for substance-related stays ($165 and $157, respectively). 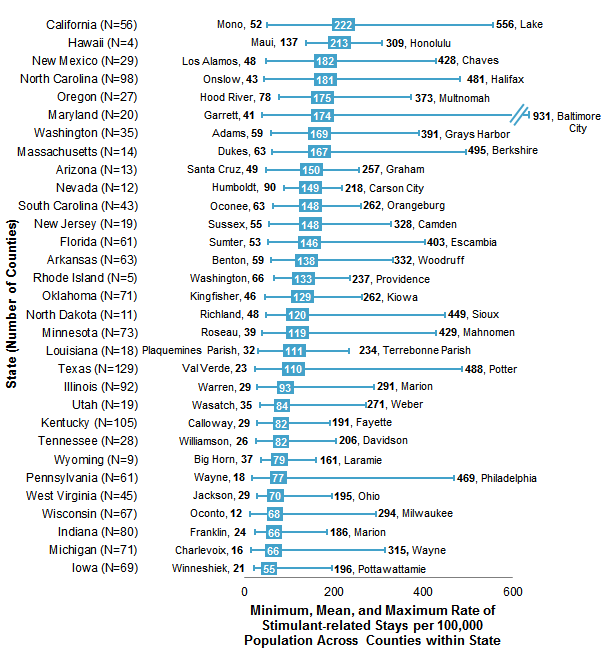 These States also ranked among those with the highest rates of substance-related stays (as shown in Table 1). Notably, California had the third highest per capita cost of substance-related stays ($156), even though the rate of substance-related stays in California (945 per 100,000 population) fell below the national average (1,064 stays per 100,000 population, Table 1). Hot spots of substance stays were associated with substantial health care costs within States. Rhode Island and Massachusetts had the highest percentages of counties identified as hot spots of alcohol-related stays, where 80.0 and 71.4 percent of counties, respectively, had an alcohol-related stay rate in the highest quintile nationally. In these States, alcohol-related stays cost nearly $100 per capita (compared with $68 nationally). The per capita cost of alcohol-related stays was highest in Rhode Island ($98), Massachusetts ($95), and Minnesota ($89); and lowest in Utah ($25), Louisiana ($34), and Arkansas ($37). West Virginia and Massachusetts had the highest percentages of counties identified as hot spots of opioid-related stays, where 65.5 and 64.3 percent of counties, respectively, had an opioid-related stay rate in the highest quintile nationally. The per capita cost of opioid-related stays in these States was $33 and $39, respectively (compared with $23 nationally). The per capita cost of opioid-related stays was highest in Washington ($44), Maryland ($41), and Massachusetts ($39); and lowest in Iowa ($7), Louisiana ($10), and Texas ($10). North Carolina (44.9 percent) and Maryland and Rhode Island (40.0 percent) had the highest percentages of counties identified as hot spots of cannabis-related stays. In these States, the per capita cost of cannabis-related stays was $16, $24, and $22, respectively (compared with $17 nationally). The per capita cost of cannabis-related stays was highest in Michigan ($26), Hawaii ($26), and Maryland ($24); and lowest in Iowa, Utah, and Arkansas (under $10). California (62.5 percent) and North Carolina (56.1 percent) had the highest percentages of counties identified as hot spots of stimulant-related stays. The per capita cost of stimulant-related stays was $32 and $15 in these States, respectively (compared with $17 nationally). 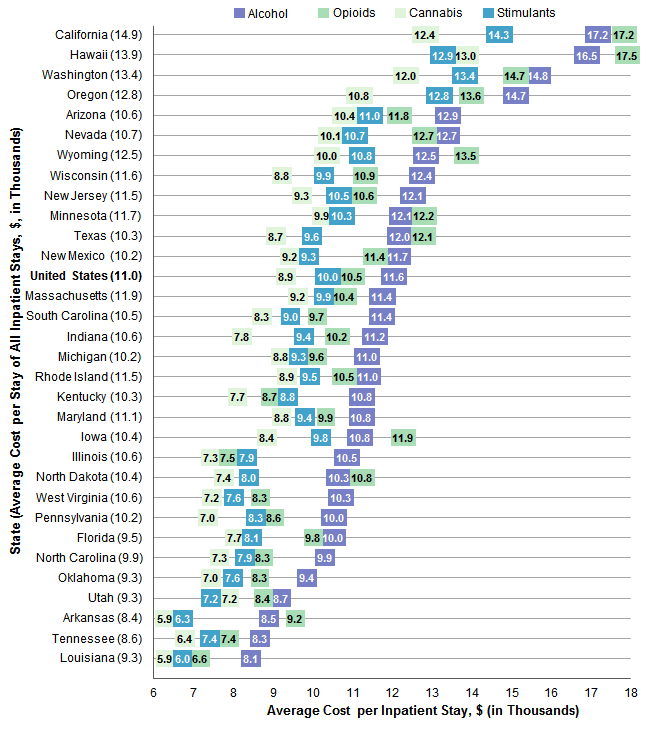 The per capita cost of stimulant-related stays was highest in Hawaii ($36), California ($32), and Oregon ($26); and lowest in Iowa and West Virginia ($6). The estimates in this Statistical Brief are based on data from the HCUP National Inpatient Sample (NIS) and State Inpatient Databases (SID), 2013 through the third quarter of 2015. The statistics were generated from the Community-Level Statistics path of HCUPnet, a free, online query system that provides users with immediate access to the largest set of publicly available, all-payer national, regional, State- and county-level hospital care databases from HCUP.23 Supplemental sources included population denominator data for use with HCUP databases, derived from Claritas, a vendor that compiles and adds value to data from the U.S. Census Bureau.24 Because 2015 was based on three quarters of data, population estimates in this year were multiplied by three-fourths (i.e. 0.75) to obtain the denominator used to calculate population-based rates. State and county rates are based on the location of the patient's residence. Data were suppressed if the reporting cell drew from fewer than two hospitals, contained fewer than 11 discharges, had a relative standard error (standard error divided by weighted estimate) greater than 0.30 or equal to 0, or because the county was missing 2 percent or more of total discharges in the HCUP SID when compared with the Medicare Hospital Service Area File.25 The Medicare Hospital Service Area file contains the number of Medicare inpatient hospital fee-for-service claims annually. This number was compared with the number of discharges in HCUP with an expected payer of Medicare to evaluate whether data for a given county should be suppressed. These rules were designed to protect patient and hospital identities, to reduce the influence of small counties with unstable rates on the results, and to ensure that HCUP data include most hospitalizations in an area. One limitation of these rules is that counties with substance-related inpatient stay rates of 0 or with low rates, which may reflect successful public health efforts to manage substance use, are suppressed. For the national and State-level information presented in Tables 1 and 2 and Figure 7, the inpatient stay rate, average cost, and cost per capita were calculated annually at the national level and for each State. Then, to obtain the aggregate 3-year estimate, they were averaged across the 3 years, weighted by the population total in each year. These State-level data include information from all counties, including those with suppressed county-level data in the other figures. Substance-related ICD-9-CM codes were included in this Statistical Brief if they involved alcohol or illicit drug use, including any use of illegal drugs, or misuse of prescription drugs or other substances. With the exception of heroin (an illicit drug) causing adverse effects in therapeutic use (E935.0), ICD-9-CM codes for adverse effects of medications in therapeutic use were excluded from the definition of "substance-related" because these adverse effects were likely caused inadvertently by medical treatment, not by the illicit use of a substance. If it could not be determined from a given ICD-9-CM code whether the diagnosis reflected illicit use of a substance or an adverse effect of a medication, the code was included in the definition of a "substance-related" only if it referred to a substance that is likely to be abused, specifically barbiturates, benzodiazepines, sedatives, prescription opioids, dextromethorphan, pseudoephedrine, amphetamines, and methylphenidate. A full list of ICD-9-CM codes that were included is shown in Table 3. Identification of substance-related inpatient stays was based on all-listed diagnoses. Note that the definition used in this Statistical Brief may differ from that in other Briefs. As a result, rates of substance-related inpatient stays may differ somewhat from similar rates reported elsewhere. In particular, the opioid definition used here includes opioid dependence/abuse in remission and neonatal abstinence syndrome and does not include opioid substances causing adverse effects in therapeutic use. The codes included in this Brief also differ from those in the Clinical Classification Software category for substance-related disorders available for query in other parts of HCUPnet. Additionally, discharges from long-term acute care facilities are excluded from data made available through the Community-Level Statistics path on HCUPnet. Total hospital charges were converted to costs using HCUP Cost-to-Charge Ratios based on hospital accounting reports from the Centers for Medicare & Medicaid Services.26 Costs reflect the actual expenses incurred in the production of hospital services, such as wages, supplies, and utility costs; charges represent the amount a hospital billed for the case. For each hospital, a hospital-wide cost-to-charge ratio is used. Hospital charges reflect the amount the hospital billed for the entire hospital stay and do not include professional (physician) fees. For the purposes of this Statistical Brief, costs are reported to the nearest hundred. HCUPnet (www.hcupnet.ahrq.gov/) is an online query system that offers instant access to the largest set of all-payer health care databases that are publicly available. HCUPnet has an easy step-by-step query system that creates tables and graphs of national and regional statistics as well as data trends for community hospitals in the United States. HCUPnet generates statistics using data from HCUP's National (Nationwide) Inpatient Sample (NIS), the Kids' Inpatient Database (KID), the Nationwide Emergency Department Sample (NEDS), the Nationwide Readmissions Database (NRD), the State Inpatient Databases (SID), and the State Emergency Department Databases (SEDD). For other information on substance use, refer to the HCUP Statistical Briefs located at www.hcup-us.ahrq.gov/reports/statbriefs/sb_mhsa.jsp. Fingar KR (IBM Watson Health), Skinner H (IBM Watson Health), Johann J (IBM Watson Health), Coenen N (IBM Watson Health), Freeman WJ (AHRQ), Heslin KC (AHRQ). Geographic Variation in Substance-Related Inpatient Stays Across States and Counties in the United States, 2013-2015. HCUP Statistical Brief #245. November 2018. Agency for Healthcare Research and Quality, Rockville, MD. www.hcup-us.ahrq.gov/reports/statbriefs/sb245-Substance-Inpatient-Stays-Across-US-Counties.pdf. The authors would like to acknowledge the contributions of Minya Sheng, Veronica Hernandez, and Sylvia Hall of IBM Watson Health, and Anne Elixhauser formerly of the Agency for Healthcare Research and Quality (AHRQ). This Statistical Brief was posted online on November 13, 2018. 1 Kamal R. What Are the Current Costs and Outcomes Related to Mental Health and Substance Abuse Disorders? Peterson-Kaiser Health System Tracker. Updated July 31, 2017. www.healthsystemtracker.org/chart-collection/current-costs-outcomes-related-mental-health-substance-abuse-disorders/?_sf_s=mental#item-start. Accessed July 30, 2017. 3 Bahorik AL, Satre DD, Kline-Simon AH, Weisner CM, Campbell CI. Alcohol, cannabis, and opioid use disorders, and disease burden in an integrated health care system. Journal of Addiction Medicine. 2017;11(1):3-9. 4 Lipari RN, Van Horn SL. Trends in Substance Use Disorders Among Adults Aged 18 or Older. The CBHSQ Report. Substance Abuse and Mental Health Services Administration. June 29, 2017. www.samhsa.gov/data/sites/default/files/report_2790/ShortReport-2790.html. Accessed June 15, 2018. 6 Green M. 8 Most Commonly Abused Drugs in the U.S. [Infographic]. Absolute Advocacy. July 1, 2014. www.absoluteadvocacy.org/most-commonly-abused-drugs/. Accessed June 15, 2018. 7 National Institute on Drug Abuse. Drug Facts: Nationwide Trends. Revised June 2015. www.drugabuse.gov/publications/drugfacts/nationwide-trends. Accessed June 15, 2018. 8 National Institute on Drug Abuse. Drug Facts: Nationwide Trends. Revised June 2015. www.drugabuse.gov/publications/drugfacts/nationwide-trends. Accessed June 15, 2018. 9 Substance Abuse and Mental Health Services Administration, Center for the Application of Prevention Technologies. Now What? The Role of Prevention Following a Nonfatal Opioid Overdose. January 26, 2018. www.samhsa.gov/capt/sites/default/files/resources/role_of_prevention_following_and_overdose-v02.pdf. Accessed June 15, 2018. 10 Lipari RN, Van Horn SL. Trends in Substance Use Disorders Among Adults Aged 18 or Older. The CBHSQ Report. Substance Abuse and Mental Health Services Administration. June 29, 2017. 11 National Institutes of Health, National Institute on Drug Abuse. Drug Facts: Nationwide Trends. Revised June 2015. www.drugabuse.gov/publications/drugfacts/nationwide-trends. Accessed June 15, 2018. 12 Agency for Healthcare Research and Quality. HCUPnet: Hospital Inpatient National Statistics. https://hcupnet.ahrq.gov/#query/eyJEQVRBU0VUX1NPVVJDRSI6WyJEU19OSVMiXSwiQU5BTFlTSVNfVFlQRSI6WyJBVF9UIl0sIkNBVEVHT1JJWkFUSU9OX1RZUEUiOlsiQ1RfQ0NTRCJdLCJDVF9DQ1NEIjpbIjU3NjciXX0=. Accessed August 10, 2018. 13 Centers for Disease Control and Prevention. U.S. Prescribing Rate Maps. July 31, 2017. www.cdc.gov/drugoverdose/maps/rxrate-maps.html. Accessed June 15, 2018. 14 Weiss AJ, Elixhauser A, Barrett ML, Steiner CA, Bailey MK, O'Malley L. Opioid-Related Inpatient Stays and Emergency Department Visits by State, 2009-2014. HCUP Statistical Brief #219. December 2016. Agency for Healthcare Research and Quality, Rockville, MD. www.hcup-us.ahrq.gov/reports/statbriefs/sb219-Opioid-Hospital-Stays-ED-Visits-by-State.pdf. Accessed July 30, 2018. 15 National Institute on Drug Abuse. Overdose Death Rates. September 2017. www.drugabuse.gov/related-topics/trends-statistics/overdose-death-rates. Accessed July 30, 2018. 16 National Institutes of Health, National Institute on Drug Abuse. Drug Facts: Nationwide Trends. June 2015. www.drugabuse.gov/publications/drugfacts/nationwide-trends. Accessed June 15, 2018. 17 Vestal C. Waiting Lists Grow for Medicine to Fight Opioid Addiction. Pew Charitable Trusts. February 11, 2016. www.pewtrusts.org/en/research-and-analysis/blogs/stateline/2016/02/11/waiting-lists-grow-for-medicine-to-fight-opioid-addiction. Accessed June 15, 2018. 18 amfAR. Opioid and Health Indicators Database: Percent Needing but Not Receiving Addiction Treatment. http://opioid.amfar.org/indicator/pctunmetneed. Accessed June 15, 2018. 19 Agency for Healthcare Research and Quality. HCUPnet Web site. www.hcupnet.ahrq.gov/. Accessed October 31, 2018. 20 Barrett ML, Heslin KC, Yoon F, Moore BJ. Case Study: National Healthcare Quality and Disparities Report (QDR) Sensitivity Analysis on Developing AHRQ Quality Indicator Estimates for 2015 Using Only ICD-9-CM Data. April 7, 2017. Agency for Healthcare Research and Quality. www.hcup-us.ahrq.gov/datainnovations/CaseStudy_QDRanalysis04072017.pdf. Accessed April 24, 2018. 21 Agency for Healthcare Research and Quality. HCUPnet Web site. www.hcupnet.ahrq.gov/. Accessed October 31, 2018. 22 The formula used to calculate county averages is provided on page 22. 23 Agency for Healthcare Research and Quality. HCUPnet Web site. www.hcupnet.ahrq.gov/. Accessed January 31, 2017. 24 Claritas. Claritas Demographic Profile. www.claritas.com. Accessed June 23, 2017. 25 Centers for Medicare & Medicaid Services. Hospital Service Area File. July 26, 2018. www.cms.gov/Research-Statistics-Data-and-Systems/Statistics-Trends-and-Reports/Hospital-Service-Area-File/index.html. Accessed July 30, 2018. 26 Agency for Healthcare Research and Quality. HCUP Cost-to-Charge Ratio (CCR) Files. Healthcare Cost and Utilization Project (HCUP). 2001-2014. Rockville, MD: Agency for Healthcare Research and Quality. Updated November 2016. www.hcup-us.ahrq.gov/db/state/costtocharge.jsp. Accessed January 31, 2017. Internet Citation: Statistical Brief #245. Healthcare Cost and Utilization Project (HCUP). November 2018. Agency for Healthcare Research and Quality, Rockville, MD. www.hcup-us.ahrq.gov/reports/statbriefs/sb245-Substance-Inpatient-Stays-Across-US-Counties.jsp.